Adrian Villarreal, 6, runs with his family during the McAllen Kids Marathon at McAllen Veterans Memorial Stadium on Saturday, Sept. 28, 2018, in McAllen. 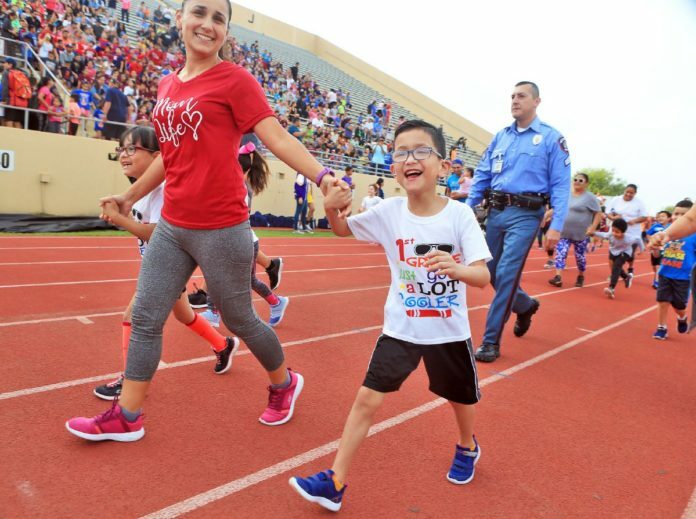 McALLEN — Thousands of small running shoes grazed the tracks of McAllen Veterans Memorial Stadium Saturday morning as children prepared for the kickoff of the fifth annual Let’s Move McAllen Kids Marathon. Though it may be hard to believe at first, the second the children cross the starting line, they’ve committed to finishing an entire marathon. Throughout the school year the children will log miles until the final mile is completed at the McAllen Convention Center, right before the McAllen Marathon Scott Crane Memorial Run. That day, the children will be able to say they ran 26.2 miles in roughly three months. Mario Reyna, coordinator for health and physical education at McAllen ISD, said that feeling of completion is what motivates a lot of these young runners. The marathon was first organized five years ago after the McAllen Independent School district took a lead from the former first lady, Michelle Obama, and her Let’s Move initiative. In 2015, the city of McAllen became involved after being promoted in the Let’s Move-Cities category. Now, the event has many partners, including several in the media, such as Telemundo and The Monitor. Reyna said the way so many partners have come together for this cause is extraordinary. At 8 a.m. Saturday many children were either shaking off nerves or trying to suppress their excitement. One of those eager runners Saturday was Krysten Garza, a second grade student at Wilson Elementary. The 7-year-old is a member and cofounder of the running club at her school. She’s been running 1 or 2 miles everyday for the past five weeks in preparation for the marathon. When she’s older, she plans on finishing a marathon herself in one day. Earlier this week she heard from German Medrazo, a McAllen resident and Mexican olympian who spoke to more than 10,000 McAllen ISD kids last week. Angie Garza, Krysten’s mom, shared in her excitement Saturday. She has been running for 15 years, and is excited to start sharing a healthy hobby with her daughter.